“About Me” | "An Eclectic Array of Topics"
I accidentally deleted my “About” page, so am trying to recreate it. Since I’m a novice, I don’t even know if my attempt will be successful. 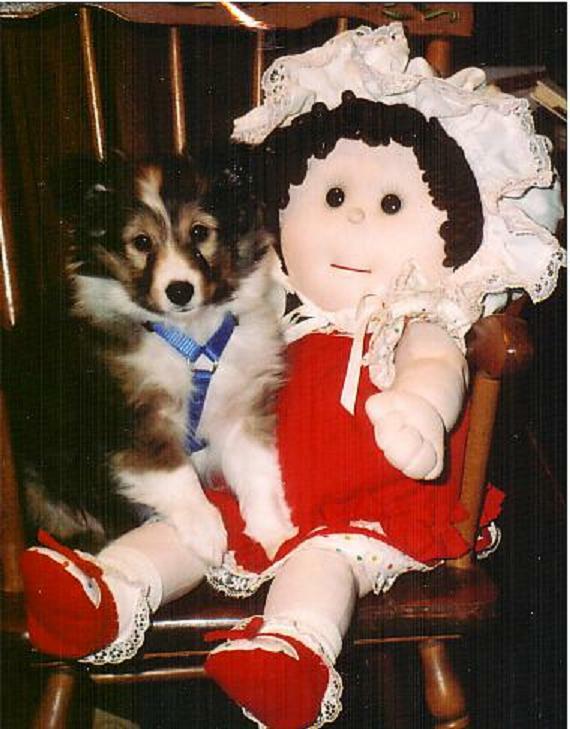 Anyway…here goes… Oh…the little Sheltie (10 weeks old at time of this photo) is my “Fur Baby”…she used to think it was OK to sleep in her big sister’s food dish…photo on the left. (Her big sister is a full sized Collie) The photo of my “Fur Baby” on the right…she was about 7 weeks old. I began using this harness on her, as she could easily out-run me. Once she began to understand that it was to her advantage not to chase “bunnies” (this meant ALL animals)…I no longer needed to use this harness. This blog will be dedicated to a whole host of topics. One post may be on politics, Civil Rights, the next may be on domestic violence, maybe living outside the nation of your birth, how to resolve relationship issues, pets and their care, or struggling with significant health issues (I’m in the midst of this currently). Of course, with my love for writing and music…there are sure to be posts written on these topics as well. I also enjoy sports…so there will surely be a post on that topic as well. However, my greatest love is the Lord and my beloved husband…we’ve been married just over two years. Prior to this I was in an abusive marriage for almost 25 years. So for me, to have met the man I am now married was truly a miracle! I suppose you can already see that I have a wide array of interests. When I decided to finally start this blog, I was told “You’ll need to select “a” specific topic that your blog will deal with. Well, there was no ONE topic that was more interesting to me than another. Then I was told that if I had numerous topics, it may not draw many readers. Yet, my knowledge of people has taught me they are most definitely not “one” dimensional! It’s my desire that those of you that take time to read this blog will, please, leave a comment. It’s a great source of encouragement to receive your feedback. Michelle, I’m looking forward to getting to know you through your blog. Thank you so much for your contribution to the “Standard Features” discussion at my blog yesterday. I truly appreciated your wisdom and encouragement! You are such a sweetie! Having the opportuinty to leave a reply on YOUR site was a blessing! Keep up the good work. I’m very interested in looking in from time to time and viewing the comments from so many readers that the Lord is using YOU to reach. Everything you write I read. You are a wonderful communicator. Articulate, sharp and accurate. You said your blog will be on various topics. We have a new West Highland White Terrier. Any suggestions on house training? We’ve only had her three weeks and we’re at our wits end. She is our first dog and is 12 weeks old. Thank you so much for the kinds words that you left on my blog. Your words helped bring me a moment of solace as we prepare for my husband’s deployment. Through your blog, I’ve learned that you love animals. We have a high-energy boxer named Joe and I know that he’ll help keep me sane during this deployment! Thanks so much for your kind words! I’ve spent today reading through your stories and they are, in a word, inspirational. Your strength and your courage and your compassion all come through loud and clear in your words. I also believe that the mix of the two is near heretical. Power over the world is what Satan offered Jesus during his 40 days in the desert (Luke 4). What Jesus taught us is that true power comes from powering UNDER people, in service. It is “being Jesus” instead of “talking Jesus”. To those of you that took the time to leave a comment, I am profoundly grateful. Your words of encouragment are precious to me. I also want to thank you for your posts at my site. I am so glad you found me! I just love your blog. When I have a bit more time, I can’t wait to jump in and comment on the posts I have just read. I am looking forward to being a regular here. Thanks for your sweet comment on my blog – I’m so happy for you that you are blessed with such a great husband now. I’m enjoying reading your posts! Hi lady! Thanks so much for visiting my crazy old blog. I want you to know you have been on my blogroll since I accidentally discovered your blog months ago. Great writing. Heartfelt experiences. Sincerity at every turn. What’s not to love! I can only join the chorus and say thank you for not only visiting my blog, but being so positive about it. I have responded to the comments you left on my blog, but I thought I would say hi here too. Am enjoying reading your blog too. You have a huge reader base, by the looks of it, and I can see why. Looking forward to our comments back and forth in the future. I think you’re doing a fantastic job. Keep up the great work. Keep telling the truth. I’ve been reading your blog for a long time. I found your site through your work with the NY Times. Yet, this is the first time I’ve left you a comment. After looking through your blogroll, I saw that you have atheists, lesbians and pastors web sites listed. For anyone that can bridge that gap between so many different lifestyles and people groups I’ve come to the conclusion you are a good soul. Rare these days. I commend you on your writing. It’s very good on each topic you cover. Like others have said, your knowledge base is large. This could only have happened as a result as one that listens and respects others. You do a wonderful job. What a wonderful comment you left! Thank you so very much for your kindness. Yes, there is an array of folks I have listed on my blogroll…each one is very special to me. Thank you so much for the advice you gave me. I thought you might not have time to spend answering all my questions. I looked up the scriptures you sent. It was exactly what I needed. I also talked to my mom as you suggested. You’re an awesome lady. Great posts here and I look forward to more. A link exchange? Michelle … this one is for you. Where is that place at the top of your blog? I have no idea exactly where that photo was taken. When I set up my blog it’s a photo that was available through WordPress. I have a sheltie as well.. he’s 14 month old. Hi Michelle. I wanted to come by and say thank you for coming to my page and the comment. I decided to come to your About Me page and I am pleasantly surprised that you have a sheltie!!!!! I have a Sheltie that is going on 14 this year, or maybe 13. I got her when she was 1 and 1/2, she’s my sweetie from before I had children and now she’s my old girl. Haven’t heard from you for a long time! Been really busy with college, currently finishing my 3rd year. Hopefully everything is going good! I am closing down my wordpress.com blog, because I just bought http://guyinthebox.com ! Still have you blog under RSS, so always will pop in and read and hopefully leave a comment!